My son and I are still planning on making it out though. Having issues trying to get the new radio installed, but should be able to get in a temporary location before we head out. Not sure if we will be arriving late Friday or just before orientation Sat. Jury duty and work are getting in the way of having fun. Candy and I are not going to make it this time. Have a good op. Getting excited about this Op! Thanks, Jim. I got it...the file opened in Gaia on my iPhone, which I'll use as my backup. The coordinates are there, which I'll use for my Garmin as my primary GPS for the op. So, all is well. The coordinates are within a short distance of each other, however the calendar has been fixed to correct the minor inconsistencies. 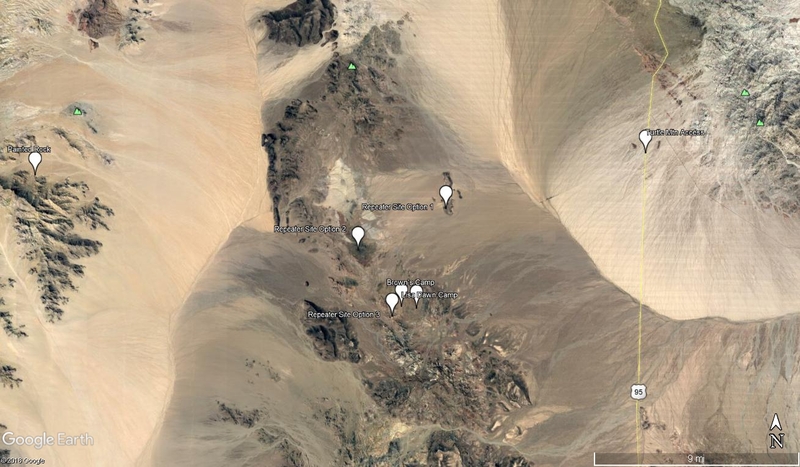 The KML file is very useful if you either have Google Earth Pro on your computer, or the Google Earth App on your IPhone or Android, as it will show the locations of Browns Camp as well as possible locations where our repeater will be deployed. See Picture Attached. If you have a tablet computer with mapping software, you can usually import a KMZ file, which will then allow you to see on your software, whether you are using Gaia, IHike GPS, BackCountry Navigator, etc. Most important is that this area has no cell phone coverage, so you will need a GPS with Maps preloaded for this area. If you need some direction in this regard, contact one of the admins for more. It appears there are two sets of sets of coordinates on the event page for Base Camp/Net Control for this op. Perhaps it doesn't matter and they fall into the "close enough" category since we're not there yet, but if there are preferred coordinates as a starting point please let me know. Also, I am unable to do anything with today's email, "Op Details KMZ file of area." Am I missing any pertinent intel?